“FOR ME, THE biggest work-on at the moment – with the tight-five forwards and everyone – is ‘seeing the game.’ It’s all about the decisions people make on the field, under pressure. So said England attacking skills coach Mike Catt of what he’s attempting to achieve with the group of players head coach Stuart Lancaster has identified as good enough to win the 2015 Rugby World Cup. An intelligent second-five-eighth in his time, Catt wants England to eventually emulate what the All Blacks are doing with their simple, skills-based approach to rugby. “You look at New Zealand; their tight five can do what their centres do and that’s why everyone else is chasing them,” Catt told Sportsmail. “They have this understanding, an ability to ‘see it’ and make the right decisions at the right time; to do the right things. There certainly have been signs that Catt’s focused work is bringing about improvements in England’s ability to make more intuitive decisions on the pitch but they remain, for now, a side who rely on a fairly rigid structure in attack. I’ve been trying the same with the men’s 2nds team I’ve been coaching the last few months. The message is clear and simple: everyone’s a carrier and everyone’s a decision-maker. Forwards are not just there to crash it up and set up / clear rucks. That sort of thinking is ancient and reduces your team’s potential in attack. Why have just seven or eight players (no. 8s always chosen as players to cross the gain line) when you can have fifteen, and seven more on the bench? Everyone needs to focus on getting through the defensive line or putting someone through the line. England talk about this a lot, but the bit I’ve bolded is very apparent. They’re getting forwards into what aren’t ‘pods’ – with a strike runner at the head and two or three ‘support’ players behind (who’re there mostly to ruck or maul). They, as do New Zealand and Australia (probably others) stretch out forwards in what look like mini ‘back lines’ of three our four. The difference between England and New Zealand, however, is what those forwards do with the ball and how they attack. Currently, in the England team, the guy who gets the ball crashes it up 9.5 times out of 10 (made up stat but seems like pretty much every one, with the odd offload or pass before contact). All that does is cut off the space that the backs previously had and everyone’s so well drilled in defence these days that they’re not really occupying more defenders to create an over-lap. (This may work at amateur level, but I challenge my players to think on a level that we’re always trying to breach the line, not stretch out phases and hope that the defence eventually collapses in one way or another. Even a few metres gained means the defence has to back up and re-position themselves, which is better than facing defenders who haven’t had to move much at all.) There are some examples in the article showing England forwards making the extra pass, but I’d argue that the second runner is not really looking to take space, as they still crash it up blindly – and even with a support runner present. The All Blacks and some groups of forwards in the Top 14 are brilliant at moving the ball about in those little units to get beyond the gainline, at least with a half break, not just smash into it and hope to march it back or break a tackle. I’m a big fan of Lancaster, but I’d like to see England let loose the shackles and make at least one more pass as they’ve got a lot of capable carriers. For amateur coaches, I challenge you to train and allow your forwards to be more dynamic rugby players – especially if they’re younger and won’t grow into / settle on a position for years to come! Put all players in realistic situations where they have to work on alignment and scan for, communicate, and exploit opportunities in high-pressure environments. Below are a couple of scenarios I use before going to a bigger game-like scenario where backs and forwards have to work together in attack. 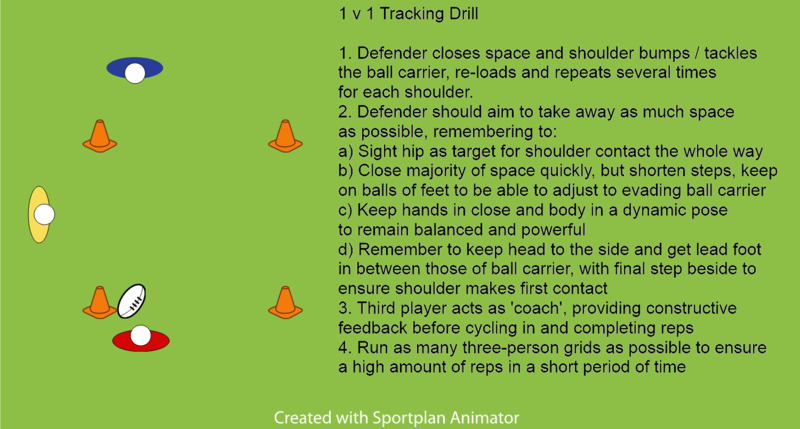 The first I use with backs and forwards, but can be adapted to just include forwards. The aim is to make that initial break and then support with lines of pursuit that avoids the sweeper(s) – at least a scrum half, if not one other. I like to keep the bags tight so they either have to draw and pass, power step or hammer through and then break out in another gear, fighting through the obstructions to get into good support positions. 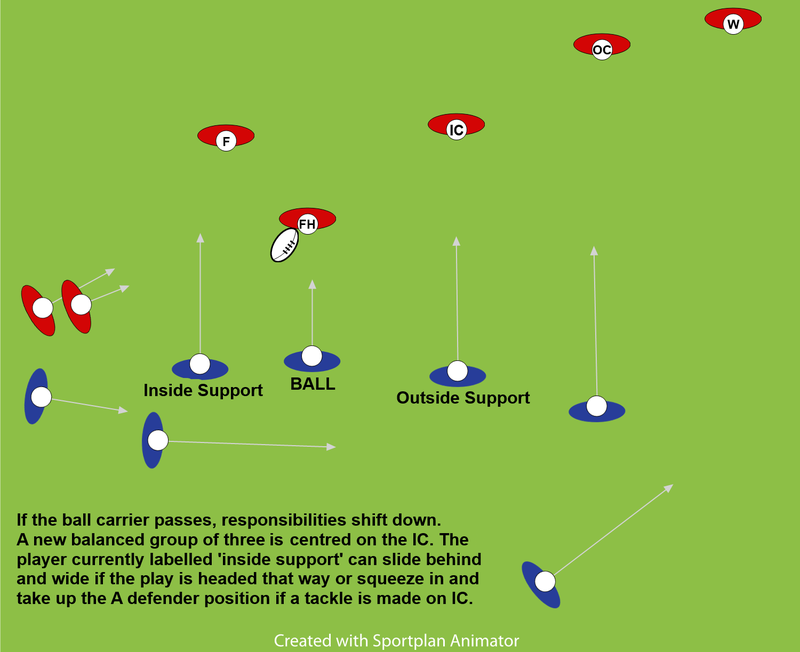 With a lot of these activities, I demand players “run in” from the side as if they were arriving to a second or third phase, stressing that creating effective attack starts by getting yourselves into position to exploit / create opportunities – so appropriate width and depth before calling for the ball so attackers can stay straight and have legitimate options left AND right (i.e. players who swing in on an arc invariably angle out, making it easy for defenders to drift). I like this to combine what can become robotic rucking drills, instead giving players a larger contextual sense that the ruck has to be dominant and efficient to provide quick ball for the next phase. 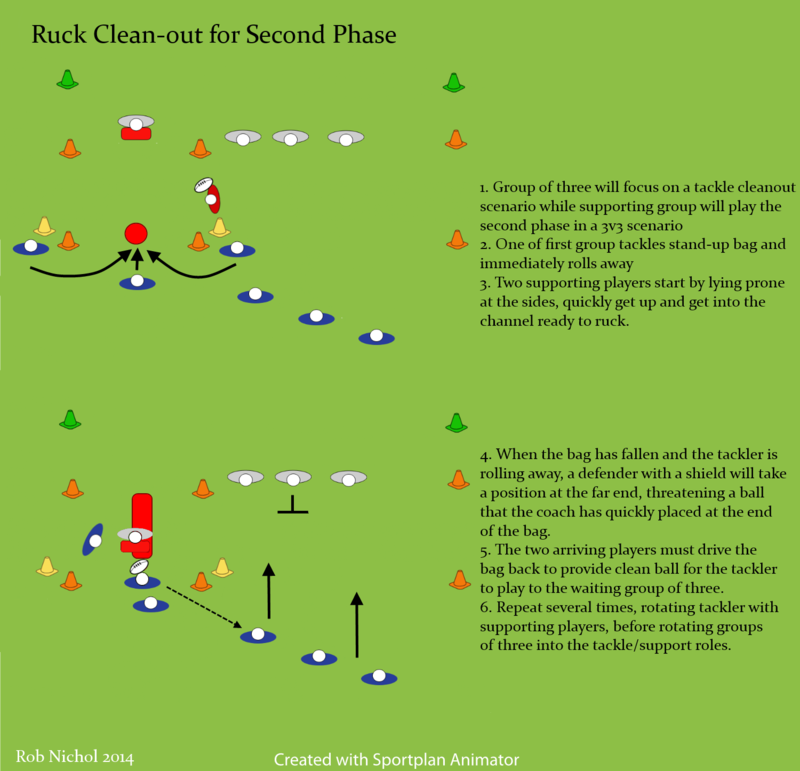 I also use this to encourage all players to move the ball from the ruck – note how the tackler rolls away quickly and acts as the half back to get the next phase started (not always realistic, but it certainly encourages tacklers to roll away quickly and get back into the play with urgency!). That said, the All Blacks are masters at this and it adds to the dynamic of their attack, allowing speedy scrum halves the chance to play in the open field and providing more width. It’s very rare that my team attacks the channel around the ruck, as it’s so heavily defended nowadays, so also reminds everyone that we’re playing from the third defender-out. A short while ago I was introduced to the concept of using points in small-sided games to increase the likelihood of players attempting something new or challenging. I first saw an example in a soccer context via the Football Association’s youth development manager Nick Levett’s Twitter account. The point of his game was not just to score a goal, but also to perform a certain skill that was a bit more advanced than the target group’s current range of abilities. Coupled with reading about the benefit of small-s ided games, I thought this would be a great fit for my team for several reasons. First off, they love playing games and though they haven’t said as much, body language and elevated intensity leads me to believe they’d rather play a game than perform a drill. Secondly, it was rare to see the majority of players attempt, say, attacking angles at all when we transitioned from a drill to a game of touch. 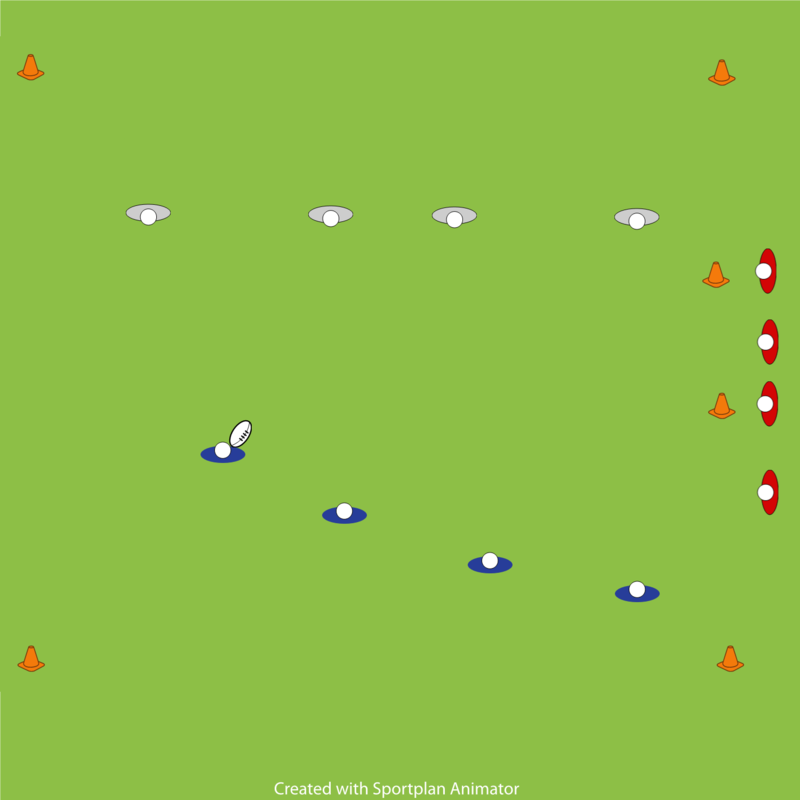 The trick, then, was to find a way to encourage players to try the skill practised in a narrow-focused drill to a game-like situation where there were many more variables and options to consider. I wondered if providing a points-based incentive to try the ‘advanced’ skill would help – and, boy, did it! Instead of doing a drill that focused on angles for 10 minutes or so, we had a little refresher – especially as we’d picked up three new players since I’d introduced the concept – on what an angled attacking or support run looked like. For the sake of simplicity and differentiation, I now call an angled run by a ball carrier a Y-line as the player starts straight and picks an angle that’d look like one arm of the letter from above, aiming for the shoulder or space behind the next defender in line. (Shoulder if trying to commit, space if trying to expose one who’s committed to the next attacker in line) I call an angled support run an unders (running inside) or overs (running outside) line, reminding the strike runner that all he needs to do is yell “tight” or “wide” to the passer and run the correct angle. Again, keeping it simple. I then told them that we were going to play a big game of touch whereby tries would be worth 5 points, and that you could get bonus points for attempting angles, even if you didn’t score the try. I nominated 1 point for a sharp Y-line (which the guys aren’t too bad at presently) and 3 points for an unders or overs line in support. If a try was scored directly from an angle, it’d be worth 10 points rather than 5. I didn’t know how it’d play out – wondering if maybe guys would over-do the angles to score cheap points – but that didn’t happen. I did, however, see a marked rise in the amount of angles attempted, but also sticking to simpler forms of attack – through the hands to expose an over-lap, an inside ball, a swerve to beat a slower player, etc as those are all comfortable tactics for them and seen as an easier way to score tries. I also made sure to reward and provide feedback in real-time and found that after tries or hand-overs were a good time to shout out the bonus points and what for. (We played touch like league – with a maximum of six phases – so it’s not as if I was counting bonus points for long stretches of play.) I kept tabs in a little note book and was even a bit shocked that after 20 minutes or so the score was a very even 43-41! In addition to the guys enjoying the game and attempting more angles within it, we had a game the following weekend and three of our five tries were scored because of good angles and supporting the linebreak created by them. However, we’d been focusing so much on attack the past month that we looked a bit slow and rusty in defence so I’ve created a similar game that rewards the desired skills in defence. This hasn’t been tested yet, but I’m thinking 10 points for a try (we want to prevent them! ), -5 for allowing a clean line break, 1 for a stop behind the gain line, and 3 for a double hit (as I want to see us working in pairs – when appropriate to contest for possession, and because most of our opponents are of the bigger, crash ball running teams). I might also give a greater incentive for our supporting players to clean up attacking rucks by awarding 2 points if they get two people over the ball in a strong position (we’ll be drilling that beforehand). 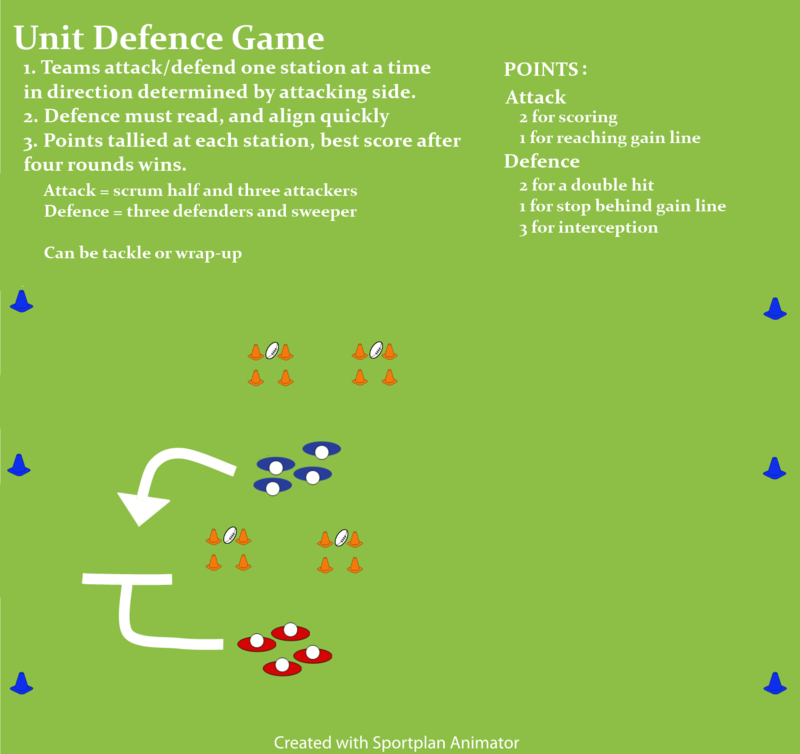 I’ve also created what’s maybe a bit more of a skill-drill than a game which will precede the one described above to encourage the players to get off the line in units and work together to stop the attacking team. We were a bit fractured at the weekend, and definitely too passive for the one team in our league that plays with intense speed all the time. Two even teams start at a point where they can run into and get set in attack and defence before the ball is played. They then play one phase of touch, wrap or tackle with the aims outlined in the points table. With that phase completed, they sprint to the next station and repeat. The field layout provides four different widths, two different passing directions, and also allows for realistic situational practice whereby both attacking and defending teams will get the opportunity to play on the ‘front foot’ and have to deal with going backwards and coming forward from the ‘back foot’. I’d have one person at each station to re-set the balls to ensure speed of turnover (like getting people to hold bags, rotating them out after a few cycles.) Depending on how many players and how much space you have, you could have two of these running simultaneously or run players through in cycles. I don’t like having a lot of people standing around, so would tweak the number of participants before having more than half doing nothing, or challenge them to provide positive feedback to the group subbing off – forcing them to pay attention and analyse. Possibly the most crucial element in team defence is support. Defence is much more than individuals making tackles. It must be a coordinated effort that’s focused, determined, and flexible. Three defenders level and coordinated with each other in front of the ball form a perfect unit to stop a strike run, providing greater focus and security for all defenders in the action area. The defender at the centre of this unit has responsibility for the ball carrier but can be assured that the channels inside and outside are protected by supporting defenders in this group of three. These roles are a mixture of zone and man-on-man styles: supporting defenders must maintain appropriate spacing to prevent the ball carrier taking a gap and they must remain square with potential attacking threats who might receive a pass or offload from the ball carrier. Communication and trust play a major role in maintaining the integrity of the line until it’s certain the unit can attempt to regain possession in the tackle contest. Changes can happen in an instant, and a pass prior to contact means a new group of three is formed in front of a new ball carrier. Using the three-player unit as a concept works with a variety of defensive styles, with the group of three staggered in one direction or the other as they come forward (for in-to-out drift or out-to-in rush styles), or especially with a flat ‘arrow head’ formation. The line doesn’t necessarily have to be absolutely flat, so long as there’s little chance a ball carrier or support runner can slip behind a defender who is too far ahead or behind the others in that unit (see Figure 1, top left). In fact, I stay clear of the word ‘flat’ because in a flat line, if one defender is beaten, it’s also likely that the supporting defenders will be beaten. Supporting defenders coming up fast in a flat line tend to over-run the tackle by a step or two, which is great to prevent or intercept offloads, but it also makes it difficult to track backward if the principle defender missed the tackle. One (in a drift or out-to-in defence) or both supporting defenders (in an arrow head) a step behind the one responsible for the tackle have time to adjust if that tackle isn’t made. I start by getting players into the habit of adopting the simple act of calling ‘My tackle!’ in small sided games. 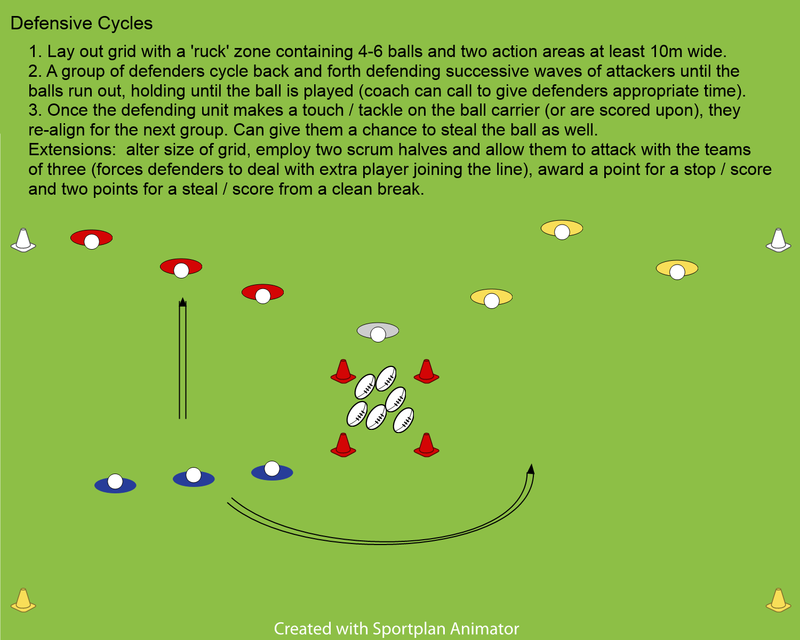 This allows teammates a number of opportunities to steal from or stop the attacking side, or plan for the next phase. 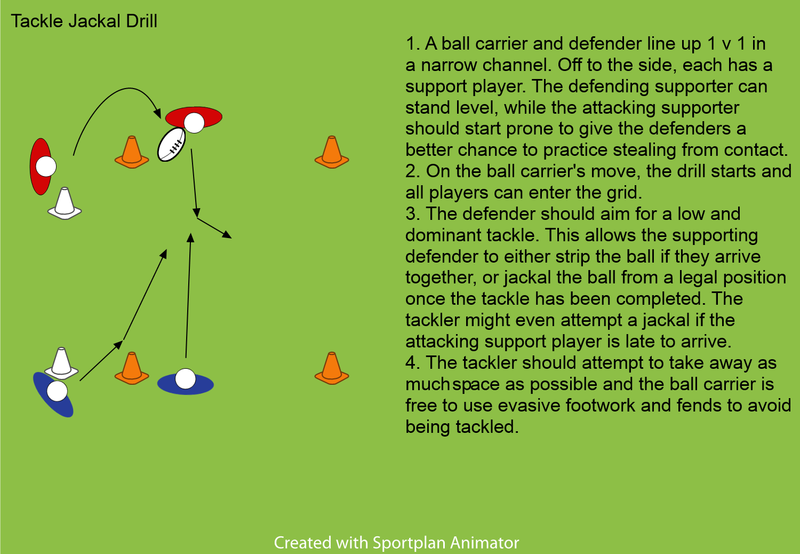 It also enhances determination and accountability on the part of the declared tackler, and establishes vital trust among the supporting defenders. It’s an all-too-common scenario where defenders over-commit to the tackle area – especially after a big line break is stopped – allowing the attacking team the opportunity to go wide on the next phase. Early communication allows arriving players to know the crucial jobs around the ruck are sorted so they can move into the next most important positions. Realistic games with even numbers – or favouring the attacking side – ensure defenders have to be on their toes. With so many visual cues to consider, they may have to be reminded to speak, but drilling communication into your team with standardised phrases will help them establish more effective defensive units. With the ball carrier shut down and the tackle made on their terms, they will have a better chance at stealing the ball or winning the tackle contest. Physical and vocal support should also come from at least one, if not two more layers of defence behind the ‘front line’. 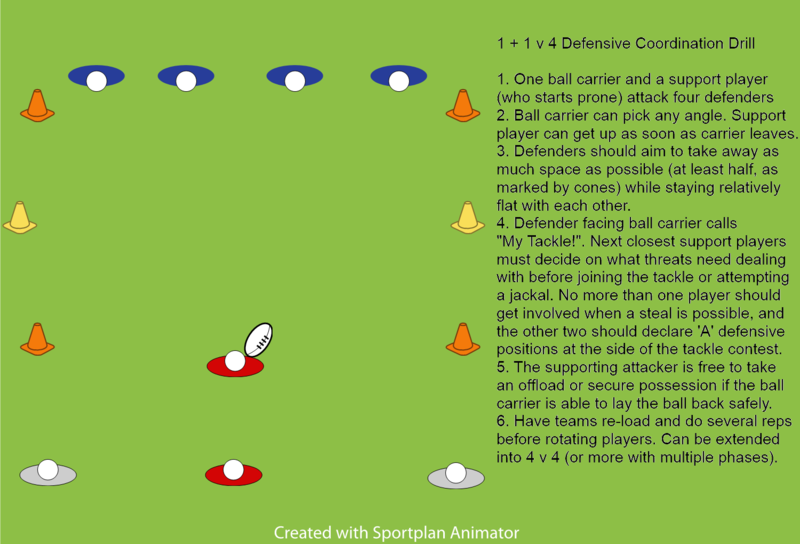 The obvious source of this is the full back, acting as both the last line of defence but also the coordinator of defenders in the outer areas of the field. I tell full backs to shadow the fly half and then stay on the inside of the ball as it is moved, staying deep enough to field kicks without having to turn but ready to come up and work with the wide defenders if needed (I let wings and full backs decide who takes ‘last man’ depending on what’s most comfortable for them). Working in conjunction with the fullback are the wingers, who typically lie deeper than the main defensive line to prevent / field kicks and be in a better position to support the full back for deep kicks (see Figure 1). Wings on the far side of the play should also be ready to cross-cover if a fullback joins the end of the line or has to deal with a line break. They should also be cognizant of wide threats, telling defenders to pull left or right as needed. The middle layer in this three-layered defensive system is the responsibility of the scrum half who, I feel, is often under-utilised in this role. All scrum halves are used to barking instructions in attack, but it’s not as often that I hear them doing the same in defence. With the full back and wings marshalling defence out wide, the scrum half ensures the A-B-C defenders are in place and focused. They can also call out immediate and emerging threats the same as an NFL linebacker. As with full backs, I advise scrum halves to stay inside the ball and follow it across, staying about 5m behind the defensive line to pick up short kicks or line breaks made by attackers cutting back inside (note the path followed by SH in Figure 1). Other players can take up this role, especially when there’s a significant over-lap, sweeping or scraping behind the main defensive line when safe to do so. My rule of thumb in these situations is for players in the main line to hold until the ball has moved two attackers away. If the defender inside the one covering the ball carrier leaves, the opportunity to pass or step back inside is there for the attacker. This goes back to the ‘defence in threes’ concept discussed earlier (see Figure 2). Hopefully, establishing continuity in defence is not something that has to be sustained for a long period. Remember, the aim is to get the ball back as soon as possible. The defending team can initiate pressure on an attacking team with aggressive ‘go-forward’ but current law interpretations favour the attacking side at the tackle contest. 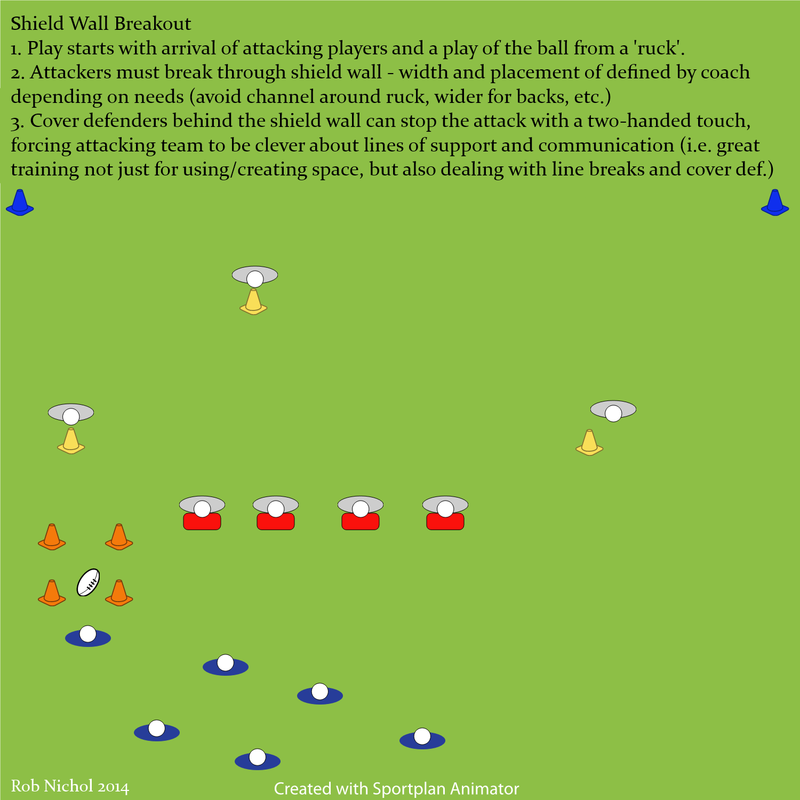 Defenders must therefore establish continuity – re-building their defensive line as quickly as possible – to halt the attacking side’s momentum (i.e. their own continuity!) and find their chance to force a turnover. Two simple words provide all the focus needed in establishing continuity: Work Rate! The defending team must work harder off the ball than the attacking team to present them with an unbroken and layered defensive line. This will allow them a better chance at stealing the ball, forcing a mistake or causing the attacking team to kick possession away. 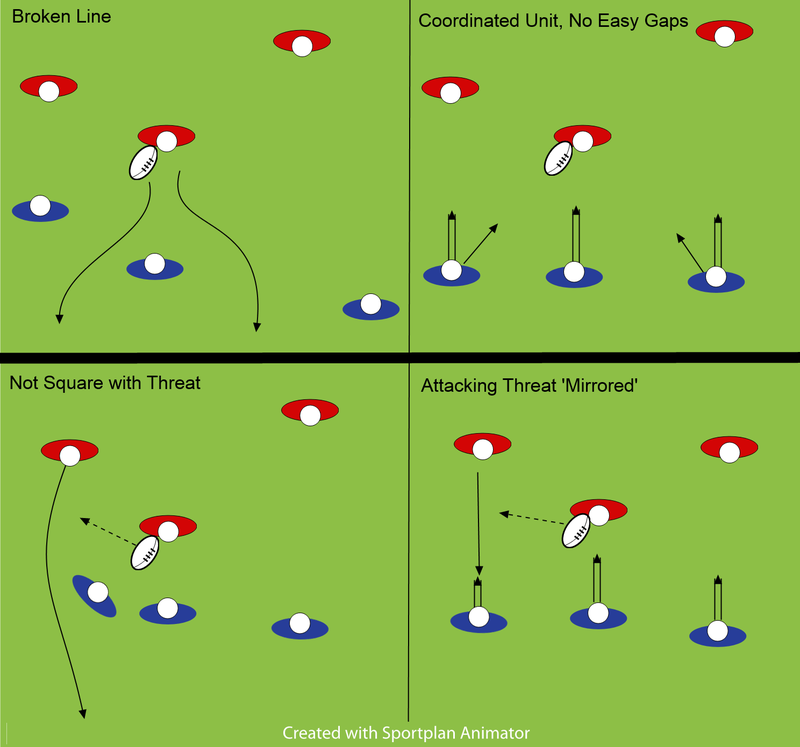 The space around the tackle contest is protected by A and B defenders – As tight to both sides to defend the seam and Bs within arm’s reach. 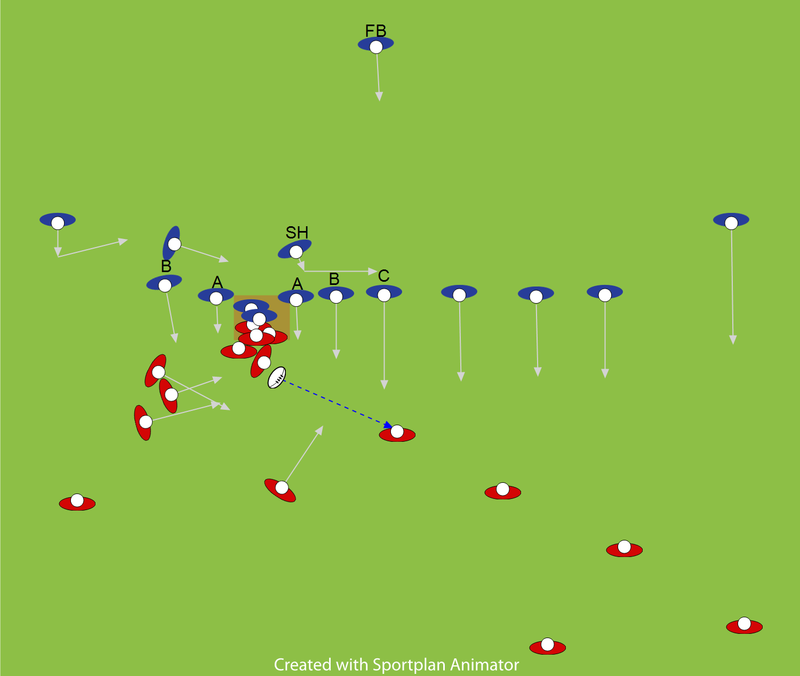 The C defender marks the obvious first receiver, completing a strong defensive unit of three that covers the space between the two half backs. Typically, A pressures the person who plays the ball, C marks the first receiver, and B forms the link between the two, acting as a guard against the offload, inside passes, or cut backs. It’s important that these defenders form up on-side quickly, communicating their responsibilities loudly so that everyone else can follow suit and nominate their responsibilities out wide. Continuity is established through speed of communication and each individual working hard to get into position before the attackers can move the ball. To build the defensive line quickly, wider defenders have to trust that the interior ones are in position and have the emerging threats in front of them covered. Without communication and trust, defenders can focus too much on the tackle contest area – bunched up around it, or with heads / bodies turned inward, ignoring threats out wide. They might also mistakenly assume the fringes are covered, focusing on what’s in front of them, but leaving easily exploitable gaps inside where line breaks can be more difficult to contain. The beauty of establishing continuity using A-B-C to build the defensive line is that it can be communicated clearly and quickly. The logical sequence reduces confusion over terminology for individual roles (compared to: post, pillar, guard, body guard, lead, action, etc.) and that means this information is processed quickly by team mates who can take up the next logical position in the line. It also highlights that whatever defensive strategy you want to employ, three players form a nice support unit that can stop most strikes and win the ball back in the tackle contest. There’s a North American sports cliché that sometimes gets bandied about in rugby circles as well that defence wins championships. While it’s true that league and World Cup finals tend to be low-scoring affairs, I believe that this is as much – if not more so – about teams playing low-risk rugby and opting to play the territory game with the boot as it is about the two best defensive teams being locked in an unforgiving stalemate. Mine is a simple philosophy that maintaining possession and executing a determined, coordinated attack wins games. If we keep the ball and score more points, we win. Simple as that. I spend a lot of time teaching players how to attack using the principles of going forward with determination and intelligence, maintaining continuity and support through effort and communication off the ball, and keeping the pressure on the defensive team such that they aren’t able to get organised and focused on stopping us. 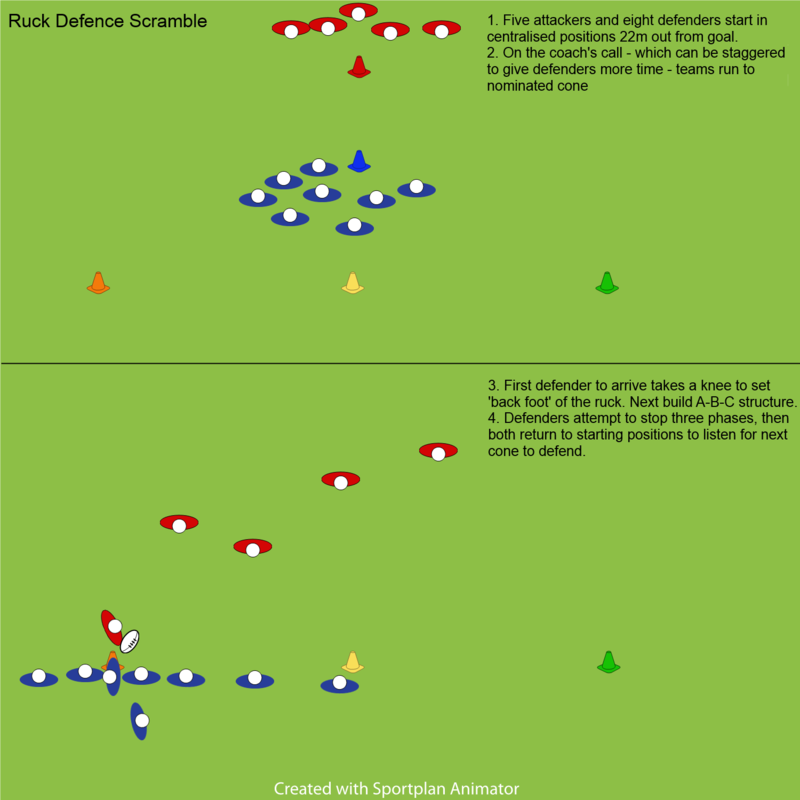 If defence truly does win championships in rugby, it’s not just about defending one’s goal line, successful teams use those same four principles against the attacking side to win possession back from them. In attack, going forward gives us the initiative and ability to determine play on our terms. The same is true in defence: we deny the opposition time and space to attack by taking it away. I challenge players to ‘attack’ on defence; never sit back and wait, as the team in possession will step around and/or pick their gaps. It’s also poor tackling technique to sit on one’s heels and simply take the hit, and that’s if the ball carrier doesn’t simple step around the frozen defender. I hear a lot of coaches at various levels these days yell “Line speed!” to their teams – urging them to come up quickly. I’m of the mind that this speed can be varied depending on the situation, but generally speaking quicker is better so long as the group in front of the ball is coordinated. I’m avoiding the word ‘flat’ here as I don’t believe it has to be rigidly so as long as the unit in front of the ball is relatively level and aren’t offering gaps that can be exploited. If an individual or unit comes up too fast, a clever distributor can fire a long pass behind or over the line to a well-timed strike runner, or kick behind them. Too slow, however, and the attacking unit will have plenty of space and time to dictate play on their terms. 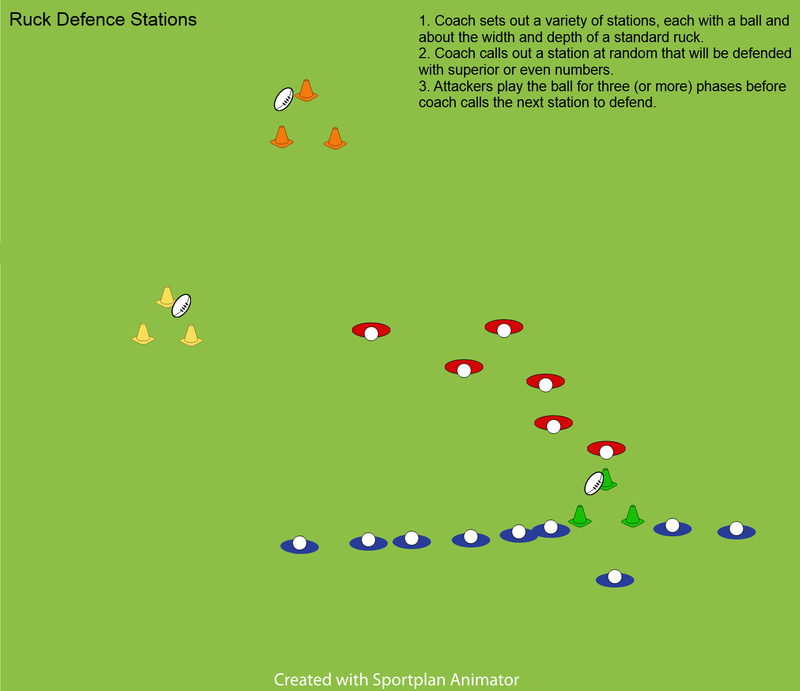 I urge teams to ‘attack’ on defence, coming forward quickly, but ensuring there are no individuals lagging behind or shooting up early (unless we have a numerical advantage and can pull off a spot tackle or interception). Lastly, coming forward in defence offers a better chance of keeping the attackers in front. Having to turn or chase to make a tackle isn’t as ideal as squaring up and completing a dominant tackle that gives us a better chance to steal the ball.